Celebrating the 10th anniversary of physics operations, the 11th EAST (Experimental Advanced Superconducting Tokamak) campaign reached a milestone in the exploration of advanced operation scenarios—achieving over 60s fully non-inductive/steady-state long-pulse H-mode plasmas under radio-frequency heating and ITER-like tungsten divertor operations, which marks the first minute-scale steady-state H-mode operation obtained on past and existing tokamaks around the world. This is a major advance beyond the achievement of a record 32s long-pulse H-mode discharge in 2012. Since then, the EAST team has made great efforts to develop the steady-state H-mode scenario on EAST. The auxiliary heating system, tungsten divertor and plasma diagnostic system have been upgraded continuously to enhance the capacity for long-pulse, high-performance operations. High power NBI and LHCD systems were developed to further extend the current drive capability and access high β regime. Tremendous efforts were dedicated to research involving RF power coupling, L-H transition, control of MHD instabilities, plasma-wall interactions, and impurity transport and control to develop advanced integrated operation scenarios, especially in the RF-dominated heating low-torque input conditions. Research results have been presented on various international conferences and journals like Nature Physics, Physical Review Letters and Nuclear Fusion and attracted interest from the world fusion community, which fostered a great many of international collaborations. The achievement is based on domestic and international collaboration, especially the joint experiment with DIII-D team of General Atomics, USA. As an open international platform, EAST attracts scientists home and abroad who have made great contribution to the experiment. In the latest campaign, EAST team further optimized the integrated operation scenario and succeeded in producing steady-state H-mode discharges over 60s with plasma performance elevated significantly over previous 32s H-mode discharges. 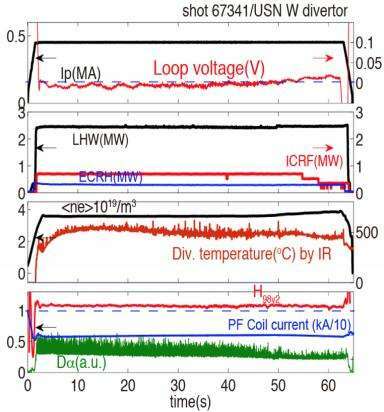 These new results were characterized by fully non-inductive current drive with zero loop voltage, ITER-like RF heating dominated via effective coupling between LHW, ECRH and ICRF, minute-level verification of ITER-like tungsten divertor operation, and good energy confinement. Additionally, operation with small-amplitude edge localized modes effectively reduced the peak heat load on the divertor target plate and influx of tungsten impurity. The ITER-relevant operation experience from EAST will provide knowledge for future operations on ITER (International Thermonuclear Experimental Reactor) and CFETR (China Fusion Engineering Test Reactor). This achievement was presented in a talk on the first day of the 26th IAEA Fusion Energy Conference and attracted attention and discussion among researchers from various countries and organizations. 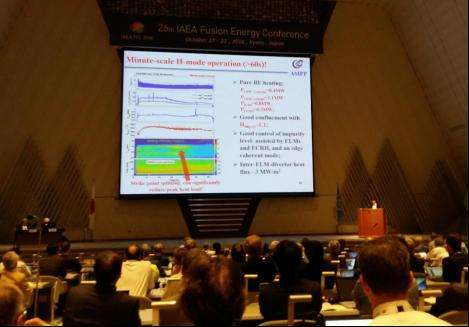 Prof. Yutaka Kamada of National Institutes for Quantum and Radiological Science and Technology, in his summary report, highlighted the EAST steady-state H-mode experiment and its relevance to the ITER project, especially the operation with the tungsten divertor. As the baseline operation scenario of ITER, it is crucial to have effective divertor heat exhaust capability under RF-heating dominated low-torque operations and tungsten divertors in line with EAST's unique capabilities. And EAST is so far the only fully superconducting tokamak with these two features, as well as the long-pulse operation capacity. Thus, its steady-state operation scenario will be an important reference for ITER and future fusion reactors.